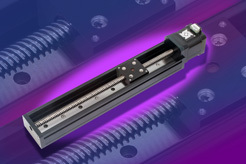 Haydon Kerk Motion Solutions develops a new linear rail capability for applications requiring extreme positioning control. Along the axial length of the system is a precision recirculating ball rail capable of extremely high-load capacity and high rigidity. Haydon Kerk Motion Solutions excels at the ability to design custom linear actuator systems for just about any application. Haydon Kerk Motion Solutions develops a new linear rail capability for applications requiring extreme positioning control. Along the axial length of the system is a precision recirculating ball rail capable of extremely high-load capacity and high rigidity. The extruded aluminum frame supports all the components for the system. In this particular design, the drive mechanism is a Haydon™ stepper motor and a precision rolled 303 stainless steel Kerk® lead screw. Attached to both the lead screw and the precision ball rail is a machined aluminum load carriage with an integral Delrin drive nut. The rail system can be easily tailored to many other applications. The design of the rail mechanics allows a maximum load of 353 lbs (1570N) in the ‘Z’ direction while still maintaining accuracy specs. Maximum roll, pitch, and yaw specs are 200 in-lbs (22.65 Nm), 132 in-lbs (13.9 Nm), and 132 in-lbs (13.9 Nm) respectively. The practical load capability will depend on the motor / leadscrew combination. The system was designed around a 3/8” (9.5mm) diameter lead screw with standard available leads of 0.025” (0.64mm) to 1.500” (38.10mm). When combined with a 1.8 degree hybrid stepping motor, very fine positioning resolutions can be configured. A brush or brushless DC motor also can be used for applications requiring higher speed and higher linear force output. Positioning resolution in the case of a closed loop DC brush or brushless motor is determined by the capabilities of the encoder system. An encoder system can be added to either the motor or the screw. For applications requiring even greater accuracy than can be accomplished with a rotary encoder, the rail system has features added to allow the integration of a linear encoder with micron resolution allowing feedback of the true load position. Visit http://www.HaydonKerk.com as a starting point to see what Haydon Kerk’s “linear motion toolbox” has to offer. Field sales engineers and product design engineers are available to answer application questions. Haydon Kerk Motions Solutions, Inc.